Happy Sunday guys! I hope you've had a great weekend =) I've been stressed out lately due to work so I took this weekend off and enjoyed myself by doing not much lol. D and I went to see The Expendables 2 today (awesome action and I love Jason Statham!!) 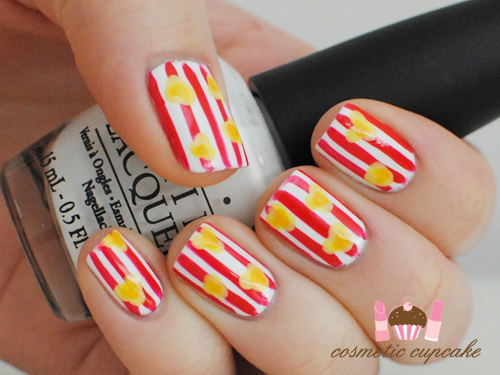 and I just had to do popcorn nails inspired by this awesome tutorial by Katy from Nailed It. She does fantastic manis and nail art tutorials! POPCORN!!! 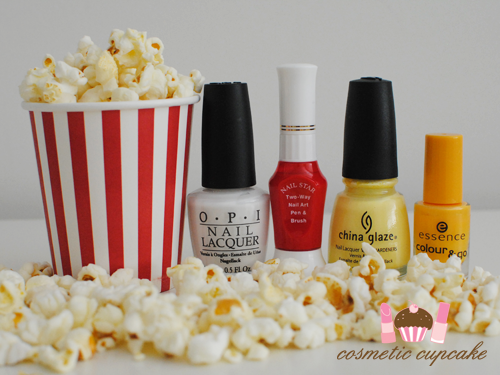 I freaking love popcorn - sweet, buttered, flavoured.. MMMMMMM! 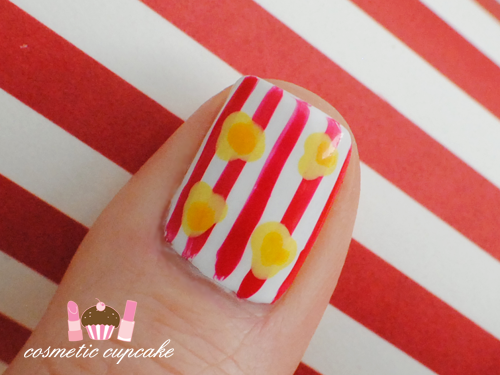 I used 2 coats of white creme OPI Alpine Snow as my base and Nail Star Two-Way nail art pen and brush in red to draw vertical lines on each nail. 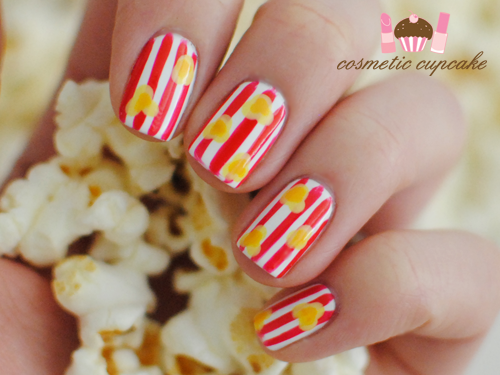 Once that all dried I used China Glaze Lemon Fizz and a large dotting tool to draw small dots close together in a popcorn shape. I then used Essence Colour & Go Sundancer and a smaller sized dotting tool for the kernel shells. I have a thing for food manicures I think haha. They are just so much fun to shoot and wear! 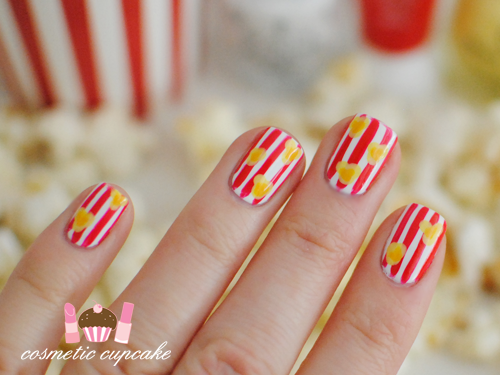 I don't want to take these popcorn nails off. My sis helped me take some of these shots and we had fun doing it even though my room was littered with popcorn bits afterwards LOL. OMGSH! This is seriously just tooo adorable! And I love your mini cup of popcorn, it's so cute! Thank you Ivy!! I tried to find a larger red and white striped container but no luck. Had to make do with a mini cup! Oh that's so nice!! Glad it made you smile hun =D Successful manicure then! No way it's super easy!! You can't go too wrong with it trust me ;) Give it a go Tram! 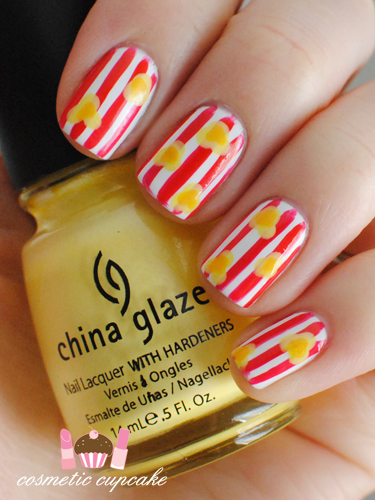 You always take the cutest themed photos with your nail art! So adorable i love it! These are so pretty :)!!! This is such an adorable look for the nails. It's perfect for TIFF week here in Toronto (Toronto International Film Festival). Oo I also love the Nailed It blog. <3 thanks lovely!! I'm not a fan of Kiera Knightley either actually, I don't think she's the best actress but she does do well in period pieces. I might have to watch it just for the costumes! Super cute! You are so creative. 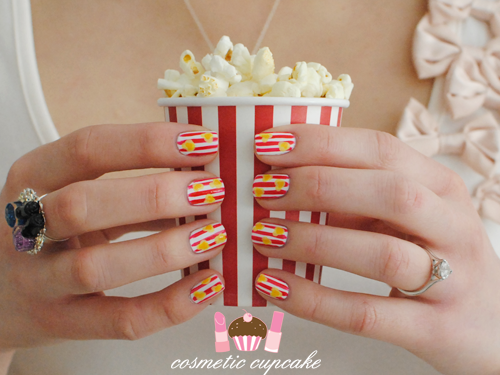 LOVE these popcorn nails!!! Way too cute!!! This is freaking amazing! I think I need to try one of those nail polish pens. I tried doing scalloped nails this week but it was a total fail.